Letters of Note: Try again, won't you? 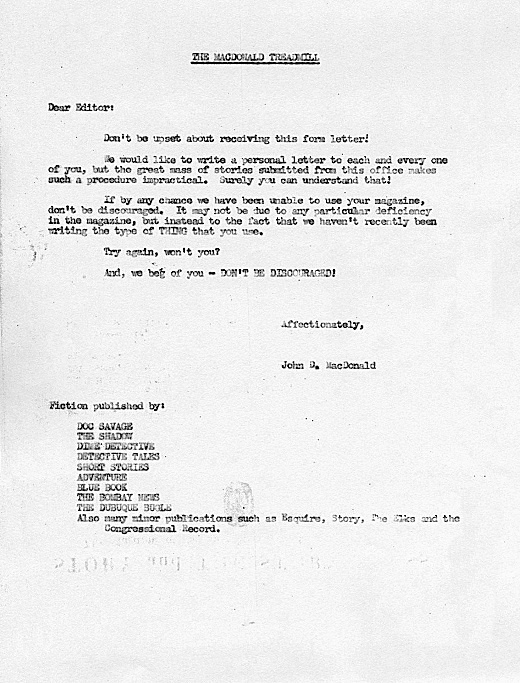 In the mid-1940s, before breaking through to become the successful novelist and prolific short-story writer many now remember, the late-John D. MacDonald was the recipient of countless dreaded rejection letters. Undeterred, he ploughed on. Some years later — at which point his services were very much in demand and he was selling his short stories to publications at an incredible rate, and under various pseudonyms — the roles reversed somewhat, and he apparently sent the following sarcastic form letter to unsuccessful editors. Transcript follows. Image supplied very kindly by D. Barrow. Don't be upset about receiving this form letter! We would like to write a personal letter to each and every one of you, but the great mass of stories submitted from this office makes such a procedure impractical. Surely you can understand that! If by any chance we have been unable to use your magazine, don't be discouraged. It may not be due to any particular deficiency in the magazine, but instead to the fact that we haven't recently been writing the type of THING that you use. And, we beg of you - DON'T BE DISCOURAGED! Also many minor publications such as Esquire, Story, The Elks and the Congressional Record.